Sr. Simone Campbell, SSS "Compassionate Conviction: Creating Change and Building Peace"
“Radical acceptance” was the theme of Sister Simone Campbell’s presentation titled “Compassionate Conviction: Creating Change and Building Peace” at the eighth annual fundraising event for the SSJ Sister Karen Klimczak Center for Nonviolence. The event was held on a gorgeous spring day, Sunday, April 19th at St. Columba-Brigid Church in Buffalo. As a tribute to Sister Simone’s “Nuns on the Bus” tours, participants entered the sanctuary through two large sides of an artist’s rendering of a bus, complete with real tires! The mood was celebratory with brightly colored Easter flowers still gracing the chancel area. We were thrilled to welcome Lt. Governor Kathy Hochul, U.S. Attorney Bill Hochul and NYS Senator Tim Kennedy present with us. Members of the Peacemakers Gang Intervention and Outreach program were also recognized. Sister Simone began her talk by asserting that the challenge of nonviolence is to fully live our lives making room for the “other” and being willing to engage in authentic dialogue where everyone’s feelings and values are respected. This is the “radical acceptance” we are called to embrace. Simone admitted to thinking at one point in her life that certain people were “mistakes of God” (which elicited much laughter!). She confessed that her sin was being so certain that they were wrong. Her relationship with Senator Paul Ryan was the example Simone shared. Since 2012 when Senator Ryan’s proposed budget included drastic cutbacks in the federal safety net (which precipitated the “Nuns on the Bus” tour), Simone has been working to understand the senator through dialogue even though their political views are often in conflict. She reported that radical acceptance has changed the way she lobbies. It is essential to creating change and building peace. A crucial insight shared by Sister Simone is that in order to create change, especially with those who are so different from us, rather than fighting against a problem, we need to stand side-by-side with each other and fight for a common vision. Simone referred to Sister Karen in saying that, like her, we need to create alliances and look for “positive intersections” where we can work together. Creating change and building peace through radical acceptance also means that we have to be willing to take in stories that break our hearts. Sister Simone used examples of people living in poverty in spite of the fact that they are working, even fulltime. She showed us a photograph of Margaret, a woman who died because she lost her healthcare along with her job. These tragedies are a form of violence. Sister Simone’s conviction is that radical acceptance and working side by side for a vision kindles the fire of the Holy Spirit in our lives. She recalled the story of the burning bush where God is aware of the suffering of God’s people and has come to the rescue. We need to be part of the rescue effort. We need to call others to this work through such practices as being “grocery store missionaries” where we engage others in dialogue about our democracy and who is being left out. We need to present a vision for change that can draw people in, a vision of a nation and a world without violence. The presentation by Sister Simone ended with her affirming that it is in Sister Karen’s witness and faith as a servant that we find the seeds for nonviolence, creating change and building peace. As a reminder of the compassionate conviction of both Sister Simone and Sister Karen, audience members were given a packet of Forget-Me-Not seeds during the singing of “Peaceprints,” the song written to honor Sister Karen’s legacy. For those who purchased it, Sister Simone autographed her book, A Nun on the Bus: How All of Us Can Create Hope, Chane, and Community, during the reception held in the social hall. Delicious food and treats along with vibrant conversation were enjoyed by all. Our annual fundraising event was a success in every way! The atmosphere was lively, but the underlying themes were serious at the Peace and Nonviolence Festival in Delaware Park’s Rose Garden. Amid the music, hula-hooping and facepainting on a pleasant late-summer Sunday afternoon, participants were trying to spread a message of peace. From shootings on Buffalo’s streets to conflict in Iraq and Syria, violence is a persistent adversary. But groups at the festival said they take heart in seeing so many others sharing their commitment. More than 60 groups were co-sponsors. While those are big-picture ideals, Casey said the message plays out in the work of the Buffalo Peacemakers, who try to keep young people on a peaceful path. Victoria Ross, a festival organizer and a peaceful conflict resolution consultant with the Western New York Peace Center, said groups have been working all along to promote nonviolence. “It’s just that the big money is not in the nonviolence,” Ross said. “The big money is actually in the violence, and of course, the violent enterprises somehow get the money so much more easily.” Rather than spend so much on the military, Ross wants to see more resources devoted to health, education, welfare and sustainable energy. The festival was one more than 200 events nationwide tied into Campaign Nonviolence, which aims to abolish war and end poverty. 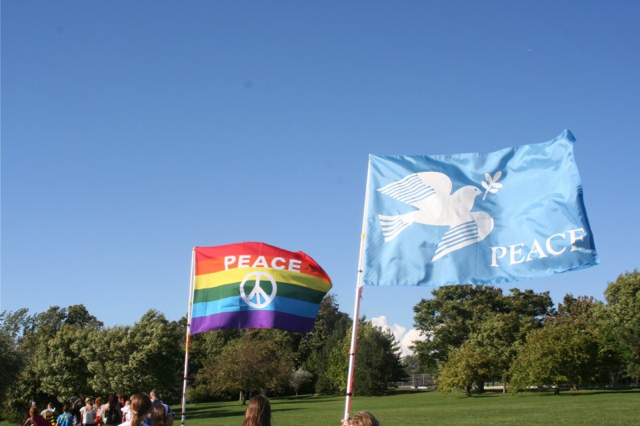 Organizers hope to turn the Peace and Nonviolence Festival into an annual, larger event. Planning for this year’s edition started only in July; preparation for next year’s will start in early 2015, Casey said. Organizers are considering a number of locations for next year’s festival – possibly including a march – and they hope to move the event around each year. Casey wants to see the festival grow to demonstrate just how many groups are working to eliminate violence.